The importance of titanium scrap price is significant because of two key aspects of titanium properties. Titanium price alone is reason enough to have every actor involved in titanium field, from raw material processors to finished product manufacturers, pay extra attention to any possibilities of reducing the production costs, including by the recovering of any discards from the production processes. Besides, it is always a good idea to try and preserve any available non-redeemable resources for future generations. As if price was not reason enough, titanium metal also presents some particularities in processing, especially because of its extremely tricky machinining. Add this to some complex applications – which are very probable due to titanium preferred fields – and you have a recipe for titanium projects that discard up to 70% of the input material. These kind of figures make titanium recycling an absolute must. So, let’s see how much titanium scrap price really is. Currently, we are talking at about $1.40 to $1.5 per pound. So, if you find, as one of my visitors recently did, two pieces of titanium weighing roughly 55 pounds, you can expect to add a maximum of $75 to your monthly budget. But, as with all scrap metal business, the prices vary a lot due to local conditions, so $1.65 values ar not unheard of. Check with your local scrap yard in the morning you're ready to sell. How is scrap titanium price really formed? Titanium scrap supply is seamlessly integrated with the production process, as I’ve shown above. Discards will results from any manufacturing process. On the other side, there are two main components that drive the demand for titanium scrap. 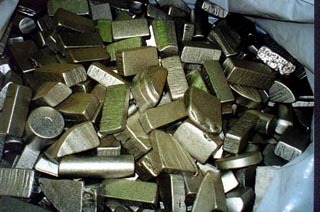 Titanium scrap is reused, along with titanium sponge, in producing new titanium ingots. The process is similar with steel recycling, and, aside by the obvious environmental benefits, it also greatly reduces energy consumption, making it profitable for primary titanium operators. Titanium is not as widespread as steel, so titanium scrap is not as available as steel scrap is. However, the increasing widespread of the titanium use has made possible the apparition of titanium scrap aggregators. Due to the special characteristics of the metal, these are more likely independent and highly specialized companies, rather that sub-division of traditional recyclers. The bulk of them are located in what is the greatest titanium market of all – the United States, and if you really need one, you will probably find it on-line. You should keep in mind though, that a scrap titanium dealer that has a presence on-line is probably interested in some volumes, such as those generated by small machining shops or other fabricators of titanium components. Chances are that an individual does not get hold of these volumes in day to day use, so if you're looking to sell your old titanium bicycle frame, better stick with the local scrap yard. The second biggest use of metal scrap that has the potential of altering titanium scrap price is in ferro-titanium. This is a low residual, low melting point titanium alloy consumed in the steel industry. Ferro-titanium is produced using titanium scrap and low carbon iron scrap. The scrap blend is such that between 10-20% and 45-75 % titanium is contained in the final product. At this ratio of titanium to iron the melting point of the alloy is 1,200°C whereas Titanium & Iron melt at around 1,650°C. Ferro-titanium is highly reactive with sulfur, carbon, oxygen, and nitrogen, forming insoluble compounds and sequestering them in slag, and is therefore used for deoxidizing, desulfurization and denitrification, aka as a cleansing agent in steel making processes. Ferro-titanium also promotes finer grain structures with the steel matrix. This can improve malleability in carbon steels, thereby increasing its versatility. Due to great use of this alloy in steel industry, not only the sectorial demand drastically influences titanium scrap price, but sometimes alters titanium prices itself. Current ferro-titanium prices are in $4.40-5.50/kg range varying with the titanium content. Keep in mind that ferro-titanium market is as volatile as the steel market itself and, as with any industrial commodity, the prices are heavily depending on the quantity traded and other specific contractual clauses – such as place and terms of delivery.